There are certain games you can count on making an appearance on every Nintendo console: Mario, The Legend of Zelda, and more recently, Super Smash Bros. Since the N64 days, Smash has been one of Nintendo's major tentpole franchises drawing millions of new fans into Nintendo's orbit, so the company's announcement of a new Smash for the Switch came as no surprise. During E3 in Los Angeles, Nintendo finally lifted the veil on the latest entry in the series, Super Smash Bros. Ultimate, to the delight of fighter fans worldwide. We had the opportunity to spend some time fighting among ourselves in the E3 version of the brawler, and we came away quite impressed. Ultimate feels both familiar and new, and this is due in no small part to its impressive roster. If you've played any of the previous Smash titles, you'll find a character you like. 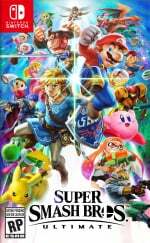 Nintendo has included every character from previous entries, landing an impressive 65 character count, assuming there are no other reveals between now and its 7th December release date. 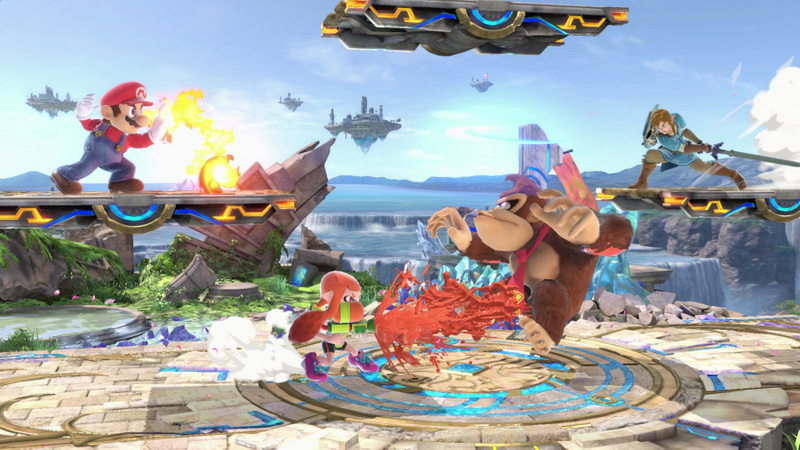 Ultimate's E3 demo didn't feature the full roster, but the selection was varied nonetheless. We had a chance to try out two of the latest newcomers: Splatoon's Inkling and Metroid's Ridley. Twenty-eight returning fighters rounded out the demo roster to an even 30. Mechanically, Smash feels somewhat more forgiving than previous iterations. We were able to pull off dodges and play on the edge of the arena much easier than we had been in the past, likely thanks to some of the mechanical tweaks that have been made. 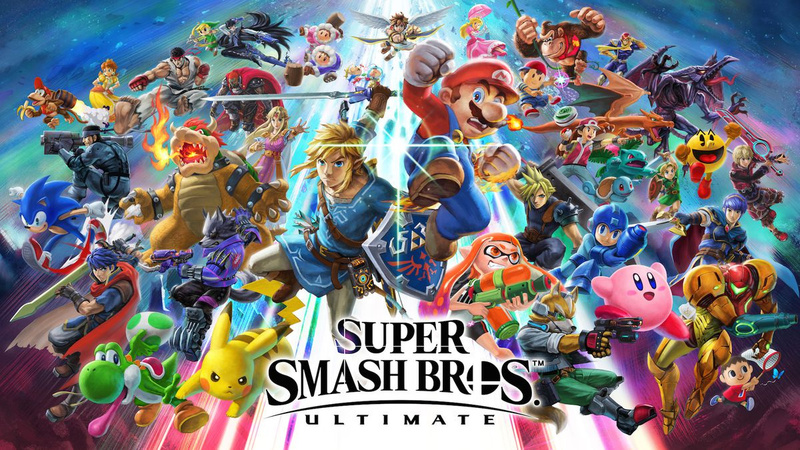 Nintendo were quick to note that thousands of changes have been made under the hood to balance Ultimate, and some of them were readily apparent, and in our opinion, quite welcome. In particular, the mid-air dodge's increased movement is useful in returning from the edge of the stage, especially when combined with each character's Up + B move. The addition of penalties for repeatedly dashing felt welcome to us, as it eventually forces your opponent to stand and fight, or risk getting knocked out. Beyond that, the only other major change we could identify, and that was shown during the direct, was the perfect shield. The perfect shield mechanic is similar to Street Fighter III's parry system. If you release the shield button with the perfect timing, your character will deflect the attack, setting up an opportunity for a counter. We have a feeling that Smash pros will employ this to great effect. During our demo, we had a chance to try out a handful of new and returning stages. The favourite among the Nintendo Life team at E3 was easily Breath of the Wild's Great Plateau. The stage takes place atop the sole tower on the plateau, crowding all four combatants onto a small-ish platform. The roof of the tower can be shattered by repeatedly smashing your foes into it, thus opening up the stage to reveal a beautiful view of Hyrule in the distance. Splatoon's Moray Towers also made the jump to Smash and it's as beautiful as it is fun to play. The stage plays with verticality in a way that most Smash stages don't, with zig-zagging staircases taking you up and through. When we played on the stage, we found ourselves dropping and jumping to chase rather than dashing and running. It was also a treat to find stages like Saffron City, which hasn't been seen since the original N64 title. Nintendo has put a great deal of care into updating these stages, and the work they put in shows. Super Smash Bros. Ultimate isn't a simple port or update, it's an entirely new game. The visuals are new and fresh and the art style is different, albeit subtly. Each character has been reworked, making them feel familiar, but new and the new characters feel like perfect additions to an already packed roster. We can't wait to see more, and we'll have much more on Smash throughout the rest of E3. Stay tuned! Super Smash Bros. Ultimate is out on the Nintendo Switch on 7th December. This genuinely looks amazing. I can't wait! A little countdown might help. I’ve heard that it feels like a new game to those who played it, which is great to hear. I wasn’t impressed by the Direct presentation but I think I’ll really enjoy the game when it releases. This feels in one way like a ‘best of’ the series, even down to its name - ‘Ulitmate’ and an advanced port of the last version. It doesn’t feel that new to me, it doesn’t feel as radical as Melee or even Brawl. Maybe it doesn’t feel that long since the last iterations. For these reasons my excitement isn’t at optimal levels just yet. It's fitting that it has 64 characters! They should have called it Smash Bros 64 Ultimate. Agh, it looks so good! I can’t wait! I’m hoping they add more new characters, at the very least Waluigi and Spring Man. Also, literally every single website is confused on the correct number of fighters. Some sites say it’s 64, others 65, each having different criteria (counting Pokémon Trainer as either 1 or 3 fighters, counting or not counting Echo Fighters, etc.). "The addition of penalties for repeatedly dashing felt welcome to us,"
A penalty for dashing? Did I miss something or should that say rolling? I haven't watched anything besides the direct yet. @Rhaoulos Thanks for that! I knew it was only 25 weeks, but not down to this precise a number! You're right, there are 65 characters right now, not 64. @Rhaoulos That is horribly evil. And yet....a GREAT IDEA! This looks absolutely incredible. Can't wait! I just hope they add new single player modes and re-work the online mode as well. I'm excited to play it. I just hope single player modes are back to the norm of being good. I almost exclusively played for glory on Wii U, and as much as I liked it, it would have been nice to have something to fall back to when I got tuckered out. @ALinkttPresent Indeed. I believe the official website lists the number as 65, counting Pokémon Trainer as 3 different characters can counting out Echoes completely. @ottospooky Pretty much everything from the graphics to the gameplay changes shows that it's a new game. I’m looking forward to it. I hope they revamp the menus and add an adventure mode as well. Happy to see people are realising it's a new game. Sakurai looked like he lost 10 years of his life so it's pretty much obvious from a joke perspective that it's a new game, on the technical side it's made by Unreal so that solves the factual issue. Have any reporters asked for confirmation on a story mode? @ottospooky none of smash bros felt ever new though. it was on next system with updated graphics, but gameplay wise nothing new here. But good for the fans right? @MH4 if I remember correctly Waluigi is an assist trophy or something like that. At this point, all I want to hear about are the single-player modes available. That's going to make or break this release for me. I am just glad we don't have to wait ages for a new Smash entry, the idea that I will be playing a new game this year has me pretty excited and out of all the characters that are returning the one I am most excited for is definitely Young Link, I wonder what his final smash is! @Snaplocket it’s new. They’ve made many tweaks - hell, 25+ minites’ worth of tweaks! In fact, that part of the presentation felt like a video of patch notes, IMO. But they mostly feel like refinements to me. Don’t get me wrong, game looks awesome. I’m just not filled with the sense of excitement I have been previously. But that’s not a bad thing. @Alucard83 great for the fans and I include myself in that! Love the series! This one just feels like a re-tread of old ground a little more than the rest of them. I think it’s because we haven’t had that long since the last games and because I still play Wii U Smash quite regularly. But I’m getting it of course. Maybe we’ve just had Smash overkill in the last two or three days!! For me it will ultimately come down to whether or not there’s sufficient good single player content. From what we know there’s not enough new content to justify a $80 purchase if you already have the last five games (+ DLC). I’m pretty optimistic though. That, or add Ashley to the playable roster. Then we’re good. I wish I liked Smash games, maybe this will be the one I get into? We have Cloud, so we should have Sephiroth. That would make my day. @Pokefanmum82 He is. My dreams were crushed lol. I want him playable. The crazy amount of fighters reminds me of Marvel Heroes ARPG. I would kill for a Smash Brothers ARPG multiplayer. Think Diablo 3 - Smash Brothers! @Paranoid388 It's rolling too much that penalizes you. Your rolls cover less and less distance the more you spam them. The graphics show that it’s a new game? IMO they should come up with something better for the sub title. Ultimate does not sound right or good. At 27 secs on that video, there is a giant bowser, which to me looks like his super smash is crazy! Or (please please please) story mode? Might be interested if there's a decent single player mode. However I expect they'll sell it later as an extra, Splatoon 2-style. When did they say its made in Unreal? @Euler 1. The game won't be $80 unless you count DLCs which it may or may not have. It's going to be $60 like past games and with some additional contents either to be unlocked or download. 2. There will be tons of contents but whether there be any single player mode for those who had no friends are still not known as Smash is usually a multiplayer free for all kind of game. 3. Ashley and the franchise she star in was never popular to Nintendo to feature her in Smash, the best she may get is either some trophy mentions or a mention in their archive but she probably won't be playable, not when there's a whole list of other characters popular than her who deserves to be there instead. 1. In Canada, it’s definitely going to be at least $80. Just as much as a NES Classic edition. 2. All of the previous Smash games (except, perhaps the N64 one) had lots of single-player content to do. I have the Wii U game for when I have friends over. Buying an $80 game for a few more returning stages and characters that are already in Melee/Brawl is not worth it. Like I said, I’m optimistic that there will again be lots of good single-player content. But I’m not fully convinced yet. 3. Yet they have three Kid Icarus representatives, and all those Fire Emblem characters? Nearly all of the characters that supposedly deserve to be there instead are either third-party or are from franchises far less popular than Warioware.